Finally, the Court issued its ruling on the case “Blanco v. ANSES” in favor of the retiree Blanco’s request to index his retirement between the years 2002 and 2008 using the Basic Salaries Index of Industry and Construction (ISBIC) instead of the Index of Average Taxable Compensation of Stable Workers (RIPTE) requested by the ANSES. The Court did not question the index used by ANSES, but the fact that its application was ruled by a resolution instead by a law. It means that if the Congress acts quickly by amending this formal error, another financial blow to the fragile situation of the ANSES will be avoided. This case testifies the level of opportunism and lightness with which the pension system is managed. The previous government violated the Constitution by not indexing those pensions above the minimum retirement between 2002 and 2008 to generate the much boasted fiscal surpluses of those times. Now, the current government applies the correct index, but with a poor instrument. Given that this public policy malpractice is systematic, it corresponds to ask whether it is sustainable to go on improvising. Japan has 27% of its population with ages over 65 and its public pension expenditure amounts to 10.2% of GDP. Argentina has barely 11% of its population over 65 and its public spending, totaling national and provincial, reaches 11.9% of GDP. 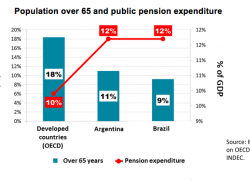 These data show that Argentina is a country with a relatively young population, but with a pension expenditure typical of an aged country. Australia, with demographic characteristics similar to Argentina, spends 3 times less on public pensions. 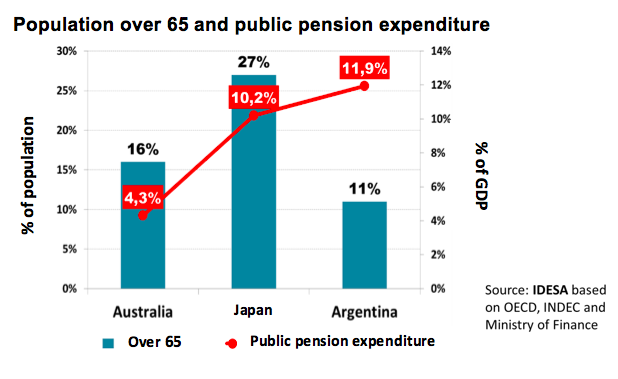 Argentina, having almost 3 times fewer older adults than Japan, spends more on pensions than the Japanese country. 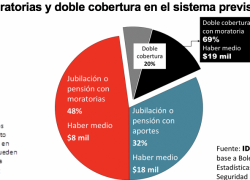 It is very illustrative and conclusive evidence that the Argentine pension system, with its current rules, is unfeasible. The passage of time will not solve the problem but will aggravate it. 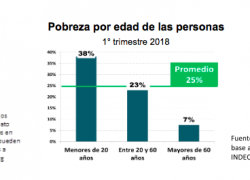 According to the projections published by the INDEC, in the next decade the young population under 20 years of age will remain constant at around 14.5 million people and only the number of people of active age (20-65) and the older ones will grow in number. This demographic dynamic shows an opportunity but also a threat. Argentina, unlike the aged countries, still enjoys the last stage of the “demographic transition”, that is to say, the population in active age grows, but transitorily. The ruling on the Blanco case demonstrates the need to simplify the pension legislation comprehensively in order to avoid ambiguities that give rise to spurious legal cases. But it is also necessary to advance on more technically complex and politically sensitive issues. Among the main ones are: to tend to the equalization of the years of service and the retirement age and to establish an automatic mechanism of gradual updating according to demographic dynamics, to eliminate the possibility of doubling retirement and surviving pension and to suppress the special “privileged” regimes. In other words, to ensure that the public pension system guarantees equitable access to pension coverage. It would be advisable that this be complemented with individual savings mechanisms for those who intend to access benefits higher than those provided for the general regime. It is very important to comply with the “zero deficit” proposed in the 2019 Budget. But it should not be neglected that the public finance adjustment is based on rudimentary tools (increase in distortionary taxes, fall in public investment, temporary loss in real terms of retirements and salaries). In order for the fiscal stability to be structural, it is essential to carry out a responsible social security reform.